This Fairline Sprint is a rare diesel engined version of this stylish British built sports cruiser. The Fairline Sprint was a new design from Bernard Olesinski, which produced a very modern, yet compact sports cruiser. The interior offers 2 V berths and a single quarter berth under the cockpit and externally the craft sported an integral bathing platform. 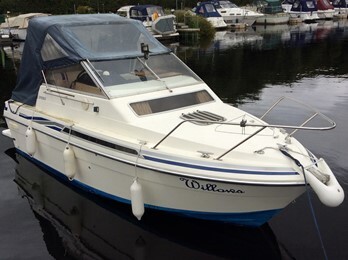 The boat was produced between January 1988 and June 1991. Engines were Volvo 4-8 cylinder units, some with duo props. Standing headroom in cabin is 5ft 7ins. Length of V berth 6ft.